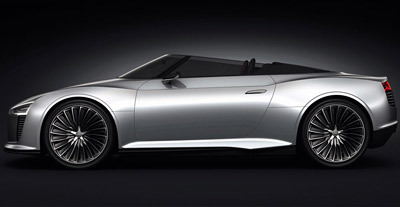 The Audi e-tron Spyder is the latest in the e-tron line of electric powered concept cars from Audi. 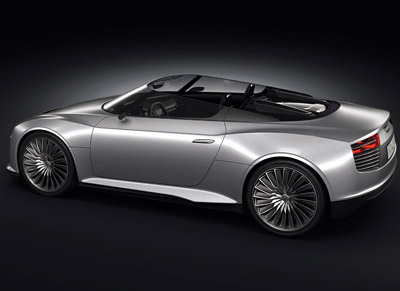 Except whereas the original e-Tron concept from 2009, and the e-tron concept shown at the 2010 Detroit Motor Show, were both 100 percent electric powered, the e-tron Spyder employs a hybrid diesel/electric drivetrain. 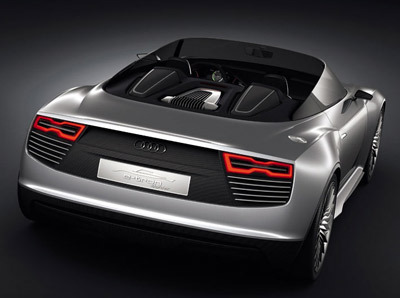 The Audi e-tron Spyder features the first use of the new generation six-cylinder, twin-turbo, 3.0 TDI engine. This engine produces 300hp - which is 50hp up on the previous iteration of the engine found in the new Audi A8. The engine's peak torque output of 650 Newton metres is high, even in the sports car segment - and for a 3.0 litre diesel it's massive. The mid-mounted, engine drives the rear wheels through a seven-speed dual-clutch transmission. But that's not it for the e-tron Spyder's drivetrain. Two electric motors - with a total output of 88 hp and peak torque of 352 Newton meters - combine with the 3.0 TDI to give the Audi e-tron Spyder more than adequate performance. It accelerates from 0 to 62mph in 4.4 seconds. While the top speed is electronically limited to 155 mph. The full-hybrid Audi e-tron Spyder can also be run in 100 percent electric mode. In residential and other urban areas, the driver can activate the electric drive by itself. The 9.1-kwH battery at the front of the car has enough power for up to 31 miles. And with a top speed of up to 37 miles, the e-tron Spyder is also able to easily keep up with city traffic while in electric mode. 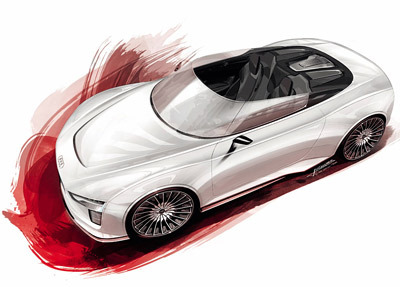 The Audi e-tron Spyder is unmistakably Audi. 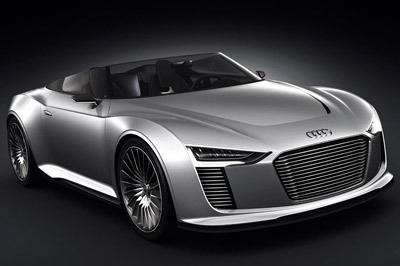 There's elements of the Audi R8 Spyder, and both the e-tron concepts mixed in to its overall shape. The dimensions of the Audi e-tron Spyder measure in at 5.9 feet (1.81 meters) wide, 13.3 feet (4.06 meters) long and only 3.6 feet (1.11 meters) in height. Compared to the e-tron coupé concept car in Detroit, the length and width have increased by 5.1 inches (13 cm) and 1.18 inches (3 cm), respectively, to underscore the sporty aspirations of the car. The dramatic sloping windscreen of the e-tron Spyder is designed to imitate the shape of a visor on a full-face racing helmet. Another element borrowed from the racing world characterizes the bonnet: the wide central air inlet, whose curve further accentuates the dynamics of the car's front end and provides a visual and functional link to the Audi R8 LMS customer race car. 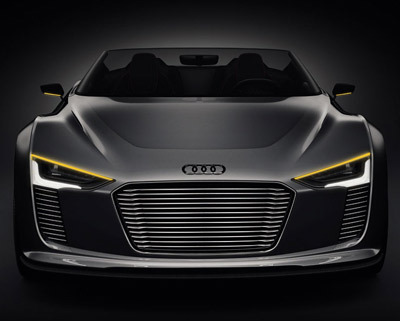 The silhouette of the e-tron Spyder concept is characterized by a sharp, sweeping line which connects the front and rear wheel arches. 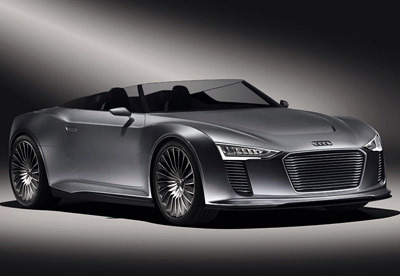 The sharply tapered front end lends the Audi e-tron Spyder show car a distinctly wedge-like basic shape. The trapeze of the single-frame grille dominates the distinctly wedge-shaped front end and is flanked by two large air intakes. They serve as cooling intakes for the electric drive system and also for the TDI engine at the rear of the vehicle. The chassis of the e-tron Spyder has triangular double wishbones at the front axle and a trapezoidal-link rear suspension made of forged aluminium components - this setup has been proven in motorsports to be the optimal design for dynamic and precision driving. A taut setup was chosen for the springs and shock absorbers, but at the same time there is a high level of comfort to the ride. The direct rack-and-pinion steering gives finely differentiated feedback. Its electromechanical steering boost varies with speed, so that the e-tron Spyder only has to provide energy while steering, and not while driving straight ahead. Just like the exterior, the interior of the Audi e-tron Spyder is stylish and high-tech yet minimalist at the same time. The slim dashboard has a curve that extends around into the door panels. 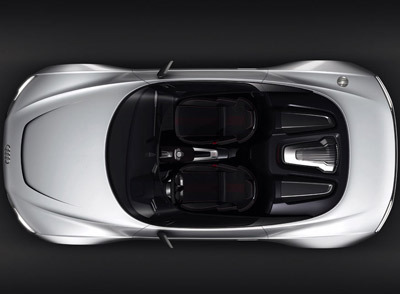 With no need to allow for a transmission, shifter and tunnel, the Audi's designers created a particularly slim and lightweight centre tunnel and convex, arching center console for the e-tron Spyder. The only control element other than that of the MMI is the flush-mounted selector lever for the automatic transmission, which extends upward from the tunnel when the vehicle is started. 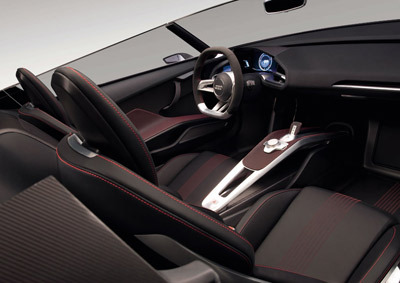 The cockpit of the Audi e-tron Spyder is also oriented toward the driver. Instead of the classic instrument cluster, the car is fitted with a large display with integrated MMI functions and flanked by two round dials. The MMI can be controlled via a touch-sensitive control panel mounted on the steering wheel - an element inspired by modern smartphones. It can also be controlled via the MMI control unit (MMI touch) on the centre console. The race-car inspired steering wheel flattened off at both the top and bottom. Speed is displayed in digital form only. The dial instrument with information about the drive system can be chosen via the menu item "Drive."